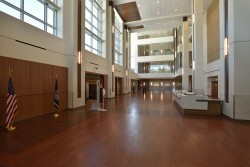 In March 2013, US Federal Properties (USFP) was selected to provide development services for one of the largest developer-led Veterans Affairs (VA) projects in the country — the 195,000 square-foot Department of Veterans Affairs Health Care Center in Tallahassee, Fla. Completed in October 2016, the clinic provides outpatient surgery, dental, optical, primary care, imaging and mental health services. The distinctive design presents a compositional balance of variety, interest and detail not normally seen in medical buildings of this size. The use of historic architectural treatments and proportions, along with glass patterning, vertical roof lines and soft coloring, result in a warm, non-institutional healing environment. The quality and ambiance of the clinic support improved patient care, staff retention and morale, while balancing technological features necessary to deliver 21st century healthcare. A three-story atrium flooded with natural light and a spacious promenade with a series of concierge-style desks and comfortable, informally grouped seating welcome patients and guests. Forested areas surrounding the site are focal points that have been incorporated throughout the facility. Designed to meet LEED Silver Certification standards, the sustainable features and energy efficiencies of the clinic meet the demands for a high-occupancy building well into the future. 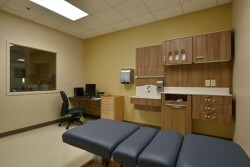 USFP is also providing property management services for the clinic.